Made with velvet and looks like it's been showered with gold flakes, why not add it to your cart? 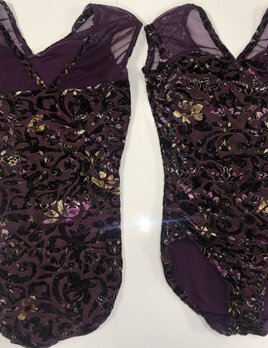 It's only available while supplies lasts- don't miss your chance to show off this Purple Arabesque Leotard Designs! The Motionwear Cap-Sleeve Dance Leotard is a favorite in class and across the studio. The cut of the scoop neck is balanced by cute, comfortable cap sleeves. It's superb as a basic on its own or as a foundation piece in any dance outfit.